Fresh and filled with flavour for lazy summer Iftars with friends! First make the Southern style curry paste: If using a pestle and mortar, pound the curry paste ingredients one by one in the order above until a smooth result is achieved. If using a blender then whizz all the curry paste ingredients together until smooth. First cook out the curry by warming the Vita Coco Coconut Oil in a pan and adding the curry paste, and half the coconut milk. Cook over a medium heat stirring regularly to avoid sticking, cook for around 8 minutes until darkened slightly and fragrant. Add the palm sugar, cook for 1 more minute then add the fish sauce tamarind and then the rest of the coconut milk. Allow the curry sauce to cool, before using half of it to marinate the prawns in. Leave for 20 to 30 minutes before BBQ’ing or grilling the prawns and basting with the other half of the coconut curry marinade. 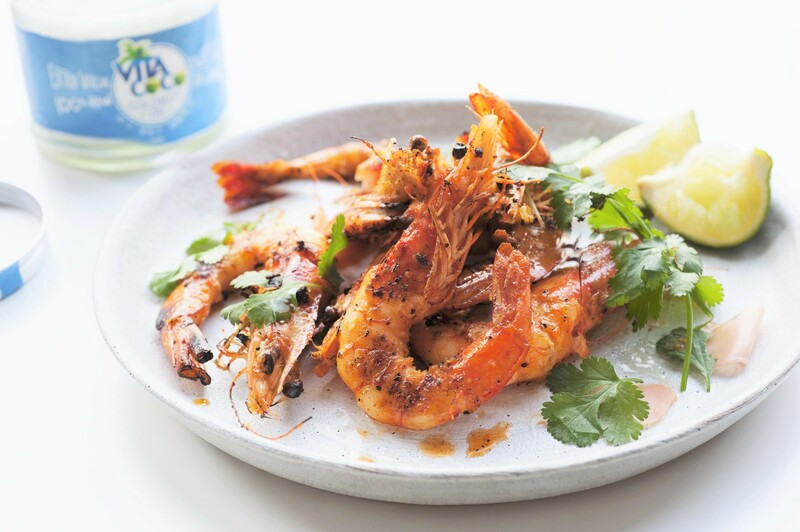 Once fully cooked serve the grilled prawns with the coriander, pickled ginger and lime wedges as a garnish.